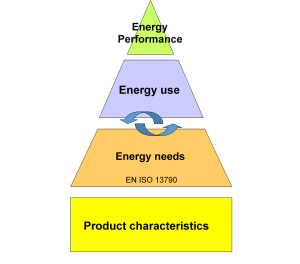 The EPBD defines the ‘energy performance of a building’ being the calculated or measured amount of energy needed to meet the energy demand associated with a typical use of the building, which includes, inter alia, energy used for heating, cooling, ventilation, hot water and lighting. 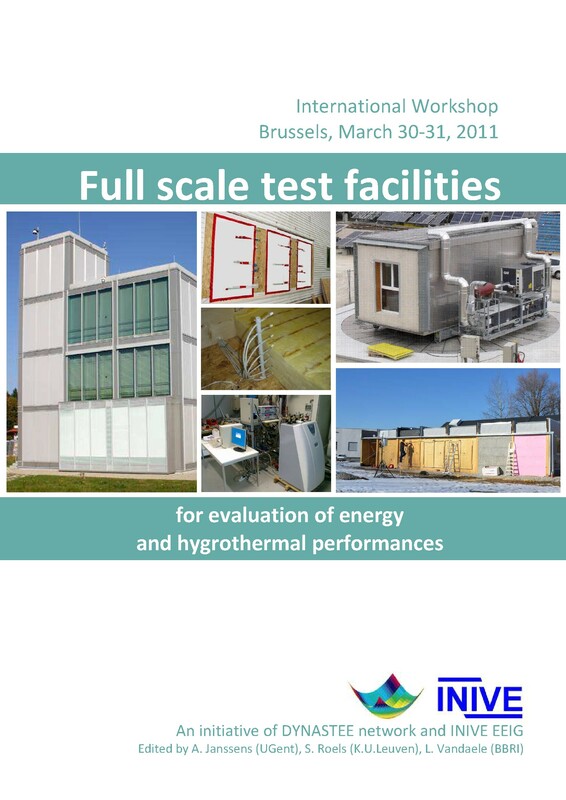 DYNASTEE and the IEA EBC Annex 58 project on the topic of ‘Reliable building energy performance characterization based on full scale dynamic measurements’ have been dealing with the particular issues of field measurements, analysis and quality. Field measurements and in situ test methods, in the context of building products, elements and structures, differ from laboratory test methods in terms of boundary conditions. Laboratory test methods are concerned with methodologies for the measurement of specific characteristics of buildings products (that define ‘declared values’ for the product performance, like the thermal resistance) and elements under well-defined and steady state conditions. In situ methods for testing are characterised by conditions of real climate and therefore variable conditions. The variability arises mainly from the effects of temperature, humidity, wind and solar radiation. In addition, in situ measurements deal with the application of building products in composed building elements or structures and therefore aspects that deal with thermal mass, heat and mass transfer. Discussions on a potential standard for in situ measurements of insulation products have been ongoing for several decades. DYNASTEE has been for many years involved in many European research projects in the area of outdoor testing, analysis and modelling of buildings and building components. CEN decided in 2009 to establish a working group (CEN/TC89/WG13) with the objective of developing a standard assessment method based on in situ testing for buildings and building components. To date, no standard has been agreed and no standard is available that adequately deals with in situ test methods (measurements and evaluation) of construction products, building elements, or building structures. Consequently, research is urgently requested since traditional test methods do not adequately characterise the performance of buildings and certain building products as they are intended to be used. ISO 9869 Thermal insulation – Building elements – In situ measurement of thermal resistance and thermal transmittance: limited in its application for one-directional heat flow and for homogenous slabs; Component characterisation. EN ISO 6946 provides the method of calculation, based on a one-directional thermal flow, of the thermal transmittance of building components and building elements, excluding doors, windows and other glazed units, curtain walling, and components which involve heat transfer to the ground. The calculation method applies to components and elements made up of thermally homogeneous layers which can include air layers. These standards refer to ISO 7345 (Thermal insulation – Physical quantities and definitions). This International Standard defines physical quantities used in the field of thermal insulation, and gives the corresponding symbols and units. This standard is restricted to thermal insulation. 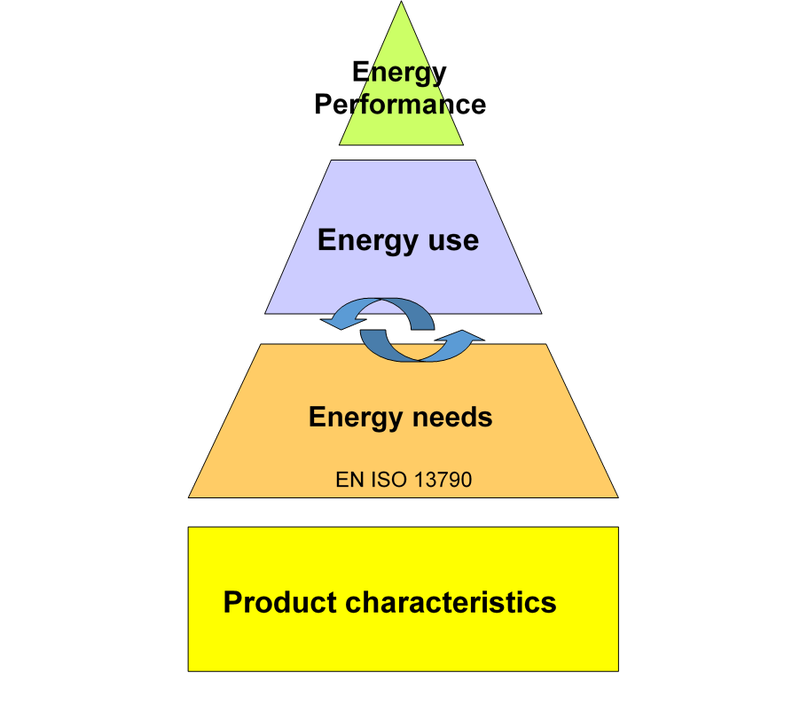 Figure shows the relation between building energy performance and product characteristics.